We’re half way through September and the giveaway in the Colorado Rockies are the beautiful yellow aspen trees sprinkled among the mountain ranges. Though the high water level season is in our wake, there’s still plenty of fun to be had on the river. 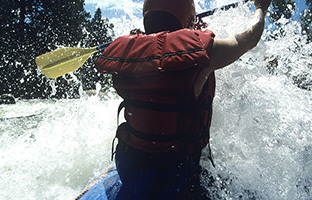 Head to Kremmling, Colorado this fall for some great whitewater adventures! We’ll start with the family friendly scenic float. Bring all generations of your crew along for some Class II milder rapids along the Upper Colorado. You’ll get to paddle through the waves with a splash or two coming over the bow, but this mellow adventure also allows you to take in your breathtaking surroundings. Take your adventure a step up by exploring the river on a ducky. You’ll get to paddle through the rapids solo or hop in a double ducky with your plus one. If you’re up for a challenge, venturing along the Colorado River in a ducky should be on your to-do list this fall. Ready for a leg workout? Take on the Colorado River on a stand up paddle board. Don’t feel like you need to stand all the way through the rapids, many find it easier to navigate the river while kneeling on the board. It’s a blast, though, and will present anyone with an action-packed 5 miles along the river. Guess what? Rafting isn’t the only activity you can get out on the water for. Whether it’s your first time casting a line or you’re a seasoned angler, AVA’s fly fishing trips are perfect for all levels of fishermen and a great fall activity in Colorado. AVA’s newest fishing activity consists of wading along the Colorado River in hopes to catch some trout. With an experienced guide, you’ll be pointed in the right direction for your best chance at catching some fish. Take a different angle at fishing by jumping in a raft with your knowledgeable guide. AVA’s fishing guides have been casting in these waters for years now, so they know the in’s and out’s and will assess the perfect fishing situation for the day of your trip. Set up your weekend to be a good one and view the fall foliage the way we know best. There are plenty of adventures to be had this season and you can learn all about them here, or call AVA Rafting & Zipline today to book!